Sell your Debt or claim! Everyone will met somebody, those clever types who can outsmart surreptitiously. They do so by means of a plan that they think. It is therefore essential that you have a creative lawyer beside you, wherever you at all times, be able to apply. That can be in debt collection matters, litigation, rent disputes, labor disputes, family conflicts etcetc. It is important not to rush straight to court, but first consider what now comprises exactly the case. Together we make a counter-plan, which is flabbergasted at the party and we win the case. Creative, fast, enterprising, always accessible, experience and decisiveness, quick as lightning, said a customer recently told us. Look, you know that speed is rewarded. collection, jurist, lawyer, bailiff, covenant, justice will speak, but you have to properly inform and persuade, win business! info@triffor.com for a quick free advice. How does selling a claim / invoice / debt operates? If you have a (not barred) exposure ie shelf invoice, you can this claim / invoice / debt sell to us. You provide us with all relevant data of the application to sell / claim / invoices/debt. We’ll then give you an appropriate offer to the claim / invoices/ debt to buy from you. The bid amount always will be significantly lower than the original invoice amount. This is due to the great risk that we run and the costs that we have to make to be able to collect the receivable and we want to make money of course. Do you agree with the amount bid, you will receive a deed of assignment to transfer the claim finally. After this you will receive the agreed amount on your bill and the bill is finally sold. To make an offer we need: Your information or that of your company The original invoice / claim /debt or judgment Your Conditions (if any) Data and information on your debtor Information (if any) already implemented procedures. A provision in the highway bills before Congress would require the IRS to hire collection agencies to collect back taxes. Congress sees it as a way of raising money to pay for highway construction. Opponents say it would lead to abuses, and that it’s been tried in the past — and cost taxpayers more than it brought in. One quick question for you – would you rather get a call from the IRS or a debt collector? If Congress gets its way, private debt collectors will be working for the IRS to recover back taxes. That’s thanks to a provision tucked into the highway bill. NPR’s Brian Naylor reports. BRIAN NAYLOR, BYLINE: Road building has traditionally been paid for with the gas tax, but inflation and more efficient cars mean the gas tax doesn’t bring in the revenue it used to. So lawmakers have turned to the Washington equivalent of looking under the seat cushions for loose change. One pile they are claiming is unpaid income taxes. Congress estimates it could find some $5 billion that way by hiring private collection agencies to go after taxpayers. But critics like Chi Chi Wu of the National Consumer Law Center say, at the most, government would get half that. CHI CHI WU: Two-point-five billion dollars is a lot of blood to try to get out of a stone. And this isn’t just funny math. This is, like, fantasy math. ORLANDO,Fla. — An Orange county man was threatened with jail and a Seminole county woman had her car repossessed. Both consumers were the targets of companies trying to collect old credit card debts they didn’t really have to pay. Action 9’s Todd Ulrich exposes the tactics used by zombie debt collectors, and helped both consumers recover what they had just lost. It was a call Alexander Villagomez said he will never forget. There was someone claiming to be a process server on the phone who said unless he paid a $5,000 debt he would be arrested. The secondary market for distressed debt and claims trading has grown tremendously. Fueled by the 21st century’s big bankruptcies – beginning with Enron in 2001 – and the development of Internet auctions and other forums that facilitate trading, the claims trading market is now a $500 billion industry. That figure represents significant opportunity. But even with extensive trading experience and legal safeguards, buyers and sellers in this still evolving market risk entering into unfavorable agreements, or, more frequently, expending resources on negotiations that are never completed or honored. Issues arise when the two parties come to the table with a different understanding of the negotiating process and then fail to disclose their expectations. In these circumstances, particularly those involving first-time sellers, relying on “standard” industry terms and conditions is risky and may later be deemed unreasonable in court. Our attorneys will identify potential issues and help you expedite an agreement. We know this marketplace and all aspects of transactions relating to distressed debt and the purchase and sale of trade claims. From the negotiation of confidentiality agreements to the negotiation of trade confirmations and purchase and sale agreements, we can anticipate and address your needs. We regularly advise both buyers and sellers to mitigate any misunderstandings. And when disputes arise, our litigators are prepared to assist you. We have built a nationally recognized reputation successfully representing parties in the distressed debt industry. Notably, we litigated the seminal case involving a dispute between an international corporation with no experience in trading claims and a major distressed claims trader. We also represented numerous buyers and sellers of claims in several of the past decade’s high-profile Chapter 11 cases. Case in Point Bankruptcy, Restructuring & Commercial Law: Distressed Debt & Claims Trading In one of only two reported decisions of its kind, a district court granted summary judgment to our client, a global manufacturer, dismissing claims brought by an investment bank for breach of contract and breach of the duty of good faith and fair dealing in connection with a failed attempt to sell trade claims in bankruptcy. In 2006, the investment bank sought to purchase trade claims that the global manufacturer held in a high-profile bankruptcy. The parties agreed over the phone on the price and type of claims to be sold, and exchanged draft agreements to complete the deal. But almost immediately, they found they could not agree on certain material terms, though they spent the next two months trying. Frustrated by the lack of movement, the manufacturer terminated negotiations and sold the claims to another bank. The first bank then sued the manufacturer, claiming that the parties had a binding agreement based upon the draft documents exchanged or, alternatively, that there was a binding oral agreement based upon the customs and practices in the claims trading industry. The case was intensely litigated, including witnesses from across the United States and abroad as well as expert testimony on the industry and its customs. The judge’s decision in favor of our client was significant, as it now serves as a guide for the operation of the booming trade claim market and the interaction of parties in the industry. Got a call about a debt you know nothing about? Here’s why. The zombie apocalypse might already be here. Zombie or phantom debt collection scams are on the rise with fake collectors going after debts that don’t exist: They’ve either been made up, paid off, discharged or forgiven. But victims are paying up out of fear. Here’s how it works: Scammers gather personal information about a person and then call and try to convince him or her a debt is owed. The scammer will start rattling off information like the person’s Social Security number, bank account number, address, date of birth and other tidbits to try and break down confidence and insert doubt. “You start to think: ‘Maybe I do owe this debt since they have all this information on me,'” said Chris Koegel, assistant director of the Division of Financial Practices at the Federal Trade Commission. Then comes the intimidation. “They inject this urgency; threaten arrest, wage garnishment, litigation and lawsuits.” The thieves will call repeatedly and eventually, out of fear, consumers agree to pay the money to end the harassment. These scams have been around for several years, but are becoming more prevalent. Since 2012, the FTC has filed eight cases against 61 defendants over phantom debt collection allegations. Scammers tend to prey on low-income individuals, according to Koegel, who added that the agency has seen a connection with fake collectors targeting people who have used or applied for payday loans. Scammers aren’t after large sums of money — usually just a couple hundred dollars. If you think you are being scammed, Koegel recommended asking for the company’s name, address and phone number to verify it’s legitimate. Debt collection is one of the most complained about industries in the country, but it continues to expand as more Americans fall into debt. According to the government, almost 30 million consumers have an account in collections. Even if you do owe money, that doesn’t give debt collectors carte blanche with their tactics. They can’t call whenever they want. Collectors aren’t allowed to call debtors before 8:00 am or after 9:00 pm unless given permission, according to the FTC. They also can’t call a person’s place of work if they are told not to. They can’t pretend to be someone else. Debt collectors have to disclose who they are and send written details on who and how much money is owed. They must also inform consumers how to verify or dispute a debt. They can’t call once they’re told not to. Collectors can call, text, email or write about a debt, but once a consumer has sent a letter to the company saying not to make contact, they have to stop. Koegel suggested making a copy of the letter and sending it certified mail with a return receipt to prove it was sent. They can’t blab about debts. While collectors can call friends, family and neighbors to get a borrower’s contact information, Koegel stressed they can’t mention the debt. They can’t immediately take your wages. Unscrupulous scammers will often make big threats to scare people, like taking the money out of your paycheck. Collectors can eventually garnish wages, but they would have to sue the borrower, win a judgment and get another order allowing the action. Tired of those annoying robocalls from Rachel at Card Services? Thanks to a tiny amendment in last week’s budget bill, you may soon be getting a lot more of them on your cellphone from debt collectors — especially if you owe money on a student loan, mortgage or any other debt backed by the federal government. 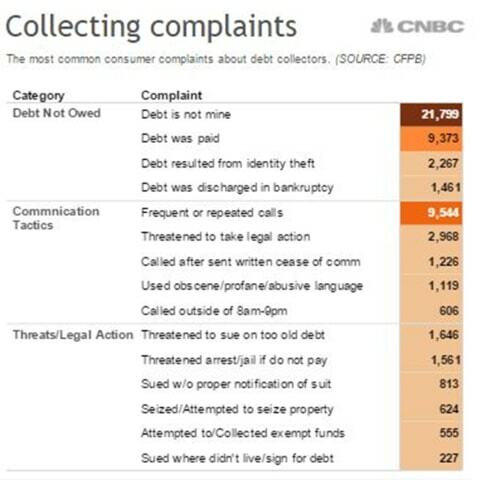 And, based on a CNBC.com analysis of over 50,000 consumer complaints related to debt collection, your cellphone may be targeted even if you don’t owe anyone a dime. The new assault on cellphone subscribers was set in motion by the bipartisan deal, which was hailed as a rare — if short-lived — moment of congressional consensus that promises to end a fiscal stalemate that has threatened periodic government shutdowns in the past few years. The bill, signed Monday by President Barack Obama, orders the Federal Communications Commission to set rules governing the debt collection industry’s new authority to use robocalls to hunt down debtors and get them to pay up. But the debt-collection industry’s desire to automate calls may owe much to the apparent inefficiency of the process. 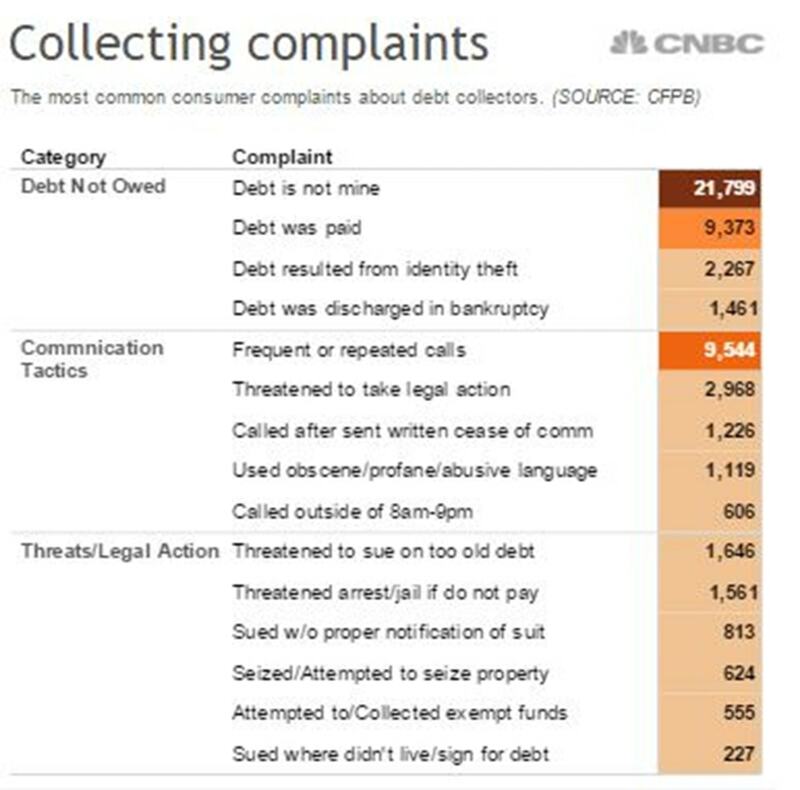 A CNBC.com analysis of complaints logged in the last two years by the Consumer Financial Protection Bureau found that roughly two-thirds of those that were related to debt collections were from people who didn’t owe anyone anything. More than 21,000 consumers reported being harassed about debts that weren’t theirs; 10,000 others said the debt had been paid or discharged in bankruptcy. Some 2,200 said the debt in question was the result of identity theft. Government and industry officials have reassured consumers that legitimate debt collectors would never threaten a consumer with arrest. Consumers should be on the lookout for fake debt collection calls from scammers posing as collection attorneys, warns Alabama Attorney General Luther Strange. According to a press release, the scammers source publicly available documents about consumers who have filed for bankruptcy. They then “spoof” the Caller ID system to make their phone number appear to be that of an attorney. Once the consumer answers the phone, scammers demand wire payments for nonexistent debts – sometimes threatening the consumer with arrest. Similar scams involving callers pretending to be affiliated with debt collectors have also occurred recently in Nebraska and Ohio, ACA International reported. The Nebraska Department of Banking and Finance warned residents of a debt collection scam involving calls to consumers about a past payday loan and threats of possible arrest if they do not make an immediate payment. And in Ohio – where identity theft has been the top form of consumer fraud – identity thieves posing as debt collectors have used consumers’ personally identifiable information (PII) to trick them into paying debts they don’t owe. Legitimate debt collectors are not consumers’ enemies and are not interested in a debt that is not owed and it is illegal to make such threats as arrest or a lawsuit. By law, the collector must inform you of your right to dispute the debt and request written verification if requested. Once sought, all collection activity stops until this proof is provided. ACA International’s Ask Doctor Debt website has resources for consumers to better understand debt collection and their rights.